With my love of the square format, maybe it was a bit strange that it took me so long to art journal in this format? I actually had a spiral bound Art Journal back in 2006 (it was journal number four) that was square, but that was a long time ago. It feels like something new, and it’s exciting! I totally love lowering my size standards, going square and working with the middle as my focal point. On this journal page: self portrait drawing (leftover print from my zine), magazine image and text, tape, product labels and some colour from crayons and pen scribbling. 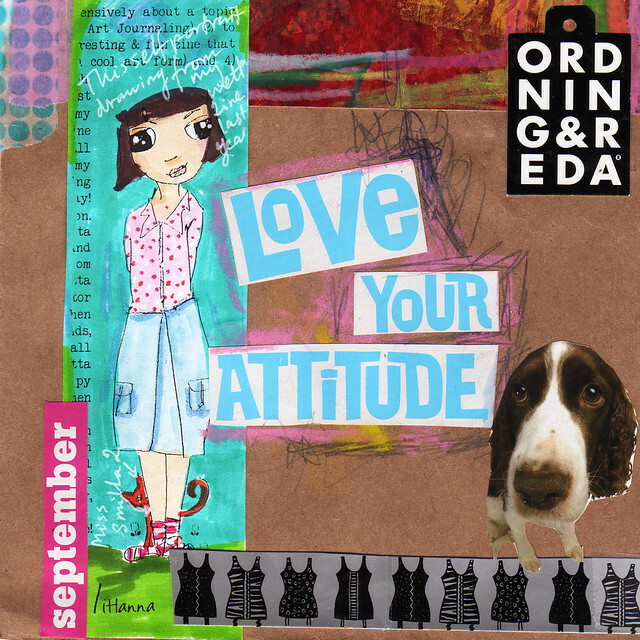 This entry was posted in Art journaling and tagged art journal peek, loose pages, square format. Bookmark the permalink. Great page, Hanna…I really like your self-portrait drawing! I am really enjoying the collage on this page, nicely done. Hanna, I would love, LOVE to see a zine from you again! You are so creative!